As promised I am finally trying to catch up… the gallery is up to date apart from this week end’s course, and at last, here is the smoke producer we have been reviewing. It costs about £30 and is available from the inventor at Mac’s BBQ or from For Food Smokers . It does exactly what it says – the only tiresome thing is that we didn’t invent it! It is only about 8 inches square, with a “maze” track of mesh, which when filled with wood dust smoulders for hours and hours… Plenty of smoke for a small BBQ or indeed biscuit tin or any other container you may want to smoke your food in! If you want more and will settle for three hours or so smoke, then you can light it in two places. We found that if we were only smoking in the top drawer of Freddy 3 (the filing cabinet smoker) then we could put the ProQ Cold Smoke Generator in the drawer below (or in the same drawer if space allowed) and it would smoke for a good 8 hours, with no risk of the heat melting the cheeses or cooking the salmon. Quick question, if I may: we’re completely new to home smoking and recently bought the ProQ cold smoke generator (which arrived with your book). I’ve been building a cardboard box smoker along the lines of the one sold by the makers. I’ve made the box as airtight as possible except for the outlet hole at the top. What I’m unsure about is whether I should make a hole near the bottom of the box as well, or if the outlet hole will provide enough oxygen to keep the wood dust smouldering. What do you advise? 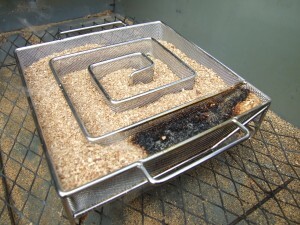 The smoke tends to seep out a bit of the eco smoker but that really doesnt matter. Hpe that helps – get back to us if we can assist further. Happy Smoking!